Context: MS is a chronic and debilitating disease, in which the immune reactions damage myelin sheath of axons in the central nervous system. Psychological consequences of MS and the treatment have been the subject of many research activities Aims: The present study examines the effectiveness of acceptance and commitment therapy (ACT) based on the life expectancy in patients with multiple sclerosis (MS). Setting and Design: This study was a randomized clinical trial and conducted from September 2016 to May 2017 in the MS patients of North Khorasan Province and Shirvan city in 2016. Methods and Material: This is an applied and quasi experimental research with pretest, posttest, and control group. Using the available sampling method, 30 samples were selected by random assignment and included in experimental and control groups (15 people per group). The instrument used in this study was Schneider's life expectancy questionnaire. The experimental group received eight sessions of therapeutic intervention. Statistical Analysis Used: We used mean and standard deviation, regression line, analyze covariance to analysis of data. Results: The results of covariance analysis showed that ACT significantly improves life expectancy in patients with MS. Conclusions: According to the results, it is expected that ACT maintains its effects in the long run with features such as encouraging people to live in the present moment, mindfulness, commitment to the pursuit of worthwhile goals, and an emphasis on process rather than the outcome. Context: Chemotherapy induced nausea vomiting and fatigue are prevalent problems following chemotherapy and pharmacologic methods are moderately efficient in alleviating them. Acupressure is a substitute approach. Aims: This paper sought to determine the effectiveness of acupressure application in relieving nausea vomiting and fatigue among children with acute lymphoblastic leukemia in compression with a placebo treatment. Settings and Design: In this single blind, randomized, placebo controlled clinical trial, 120 hospitalized school age children with ALL, randomly divided into experimental and placebo groups. Subjects rated the intensity of nausea and fatigue by visual analog scales. 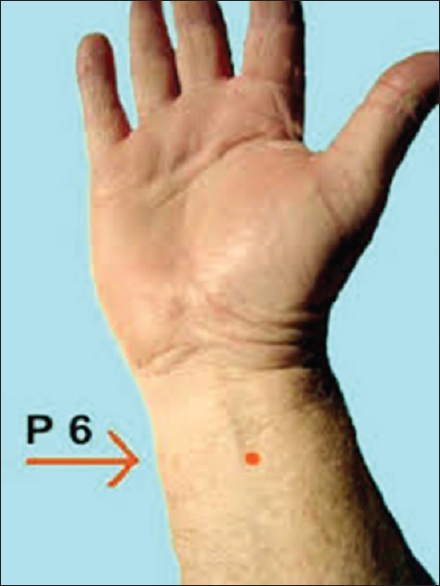 Material and Methods: In the experimental group, finger acupressure on p6 and ST36 (true points) and in the placebo group on SI3 and LI12 (sham points) was applied. Symptoms of nausea and fatigue intensity immediately and an hour postintervention evaluated. Then variable of nausea vomiting and Fatigue was also measured 12 h postintervention by the instruments of Adapted Rhodes Index of Nausea and Vomiting for Pediatrics by Child and Fatigue Scale Child, Respectively. Statistical Analysis Used: Data were analyzed by SPSS version 16.0. Results: Significant differences were observed between two groups based on the fatigue and nausea intensity immediately and an hour postintervention with confidence interval 95% and P < 0.001. Conclusions: Applying one time acupressure may reduce the intensity of nausea immediately postintervention and fatigue and nausea at one hour post treatment. Hence, acupressure could be recommended as a helpful, nonpharmacologic method for some cancer related fatigue and chemotherapy induced nausea vomiting management. Context: Brain injury can cause coma and organized auditory stimulation (OAS) is thought to be associated with improvements in the level of consciousness. 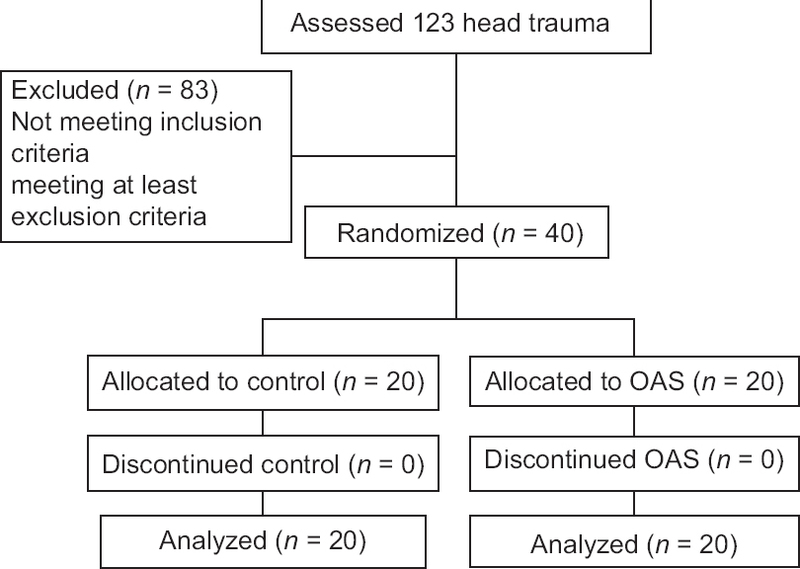 Aims: Determine of the effect of OAS on levels of consciousness in comatose patients with head injury Setting and Design: This study was a randomized clinical trial and conducted from July 2012 to February 2013 in the Panje Azar Hospital of Gorgan, Iran. Materials and Methods: The patients from critical care units were enrolled and randomly allocated into two groups, each group 20 patients. The intervention group underwent OAS using a nurse's voice who tried to call the patients' attention to their place, time, identification, family, and profession. This stimulation was conducted thrice daily for 10 days, and patient consciousness was measured by the Glasgow Coma Scale (GCS). Statistical Analysis Used: We used mean and standard deviation, Chi square, t test, and repeated measures to analysis of data. Results: The level of consciousness increased in both intervention and control groups, but the increase in the intervention group was more than the control group (P < 0.01). A significant difference in GCS between the intervention and control groups was observed on day 10 (P < 0.001). Repeated measures ANOVA showed significant differences within groups including time effect, interaction of time and intervention (P < 0.001). Conclusion: The level of consciousness of patients improved following an organized OAS by the nurses. Therefore, OAS likely will be a useful and applicable intervention for patients in Intensive Care Units. Context: Nursing process is the systematic method of thinking used by nurses to develop an individualized plan of care for patients. Effective use of the nursing process depends on a nurse's familiarity with the standardized nursing language. Aim: This study evaluates the utilization of nursing process on the day of admission and within 24 h of patient admission in a teaching hospital. Setting and Design: Descriptive and Retrospective design was utilized. 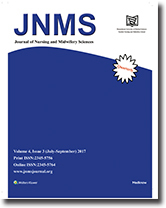 Materials and Methods: Systematic sampling technique was adopted to evaluate 959 patients' records from 2014 to 2016 in 2 medical and 2 surgical wards over 3 months period using a self designed checklist. Statistical Analysis Used: Data collected was analyzed using SPSS version 21 and presented as frequencies and percentages. T test was used to test the significant difference between variables with P value set at ≤ 0.05. Results: Only 24.9% of the medical records contained the nursing process form. On the day of admission, <25% of the charts included a complete record of nursing assessment, nursing diagnoses, nursing intervention, and the evaluation. The highest phase of nursing process recorded is nursing diagnosis followed by patient assessment. At 24h postadmission, no significant increase was noted in the phases of nursing process recorded. There was a significant difference between the frequencies of documentation of nursing diagnosis and the nurses' area of practice (P = 0.001). Conclusions: Nursing process utilization remained poorly incorporated into the activities of nurses in this institution. Therefore, continuing professional education on nursing process and supervision should be mandated. Context: Despite the emphasis on the preconception care, the majority of people are not aware of how environmental and lifestyle factors influence reproductive and fetal health. Aims: The objective of this study was to determine knowledge and attitude of women in reproductive age about preconception health in the context of free and universal access to preconception health care. Setting and Design: A cross-sectional study in public health centers. Materials and Methods: This study was performed using a convenient sample of 400 women presenting to public health centers in Abhar, Iran. Knowledge and attitude were assessed using researcher-made questionnaire. Questionnaire went through validity and reliability process. Statistical Analysis Used: Data were analyzed using SPSS version 19. The knowledge and attitude scores among subgroups according to demographic characteristics were studied using ANOVA test. Results: Over two third (68.8%) of women had adequate knowledge about preconception care. Sixty nine percent had positive attitude towards preconception care. Education and age were significantly associated with knowledge and attitude. Conclusion: Despite the relatively high level of knowledge, nearly half of the women perceived preconception health optimization as difficult that may lead to not engaging in preconception health behaviors. The younger women and those with fewer years of education should be focus of preconception health program. Child abuse is one of the most challenging social problems worldwide. Failure to report child abuse may lead to the aggravation of the situation and increase the probability of further abuses. This study aimed to determine the challenges of child abuse reports by healthcare professionals. 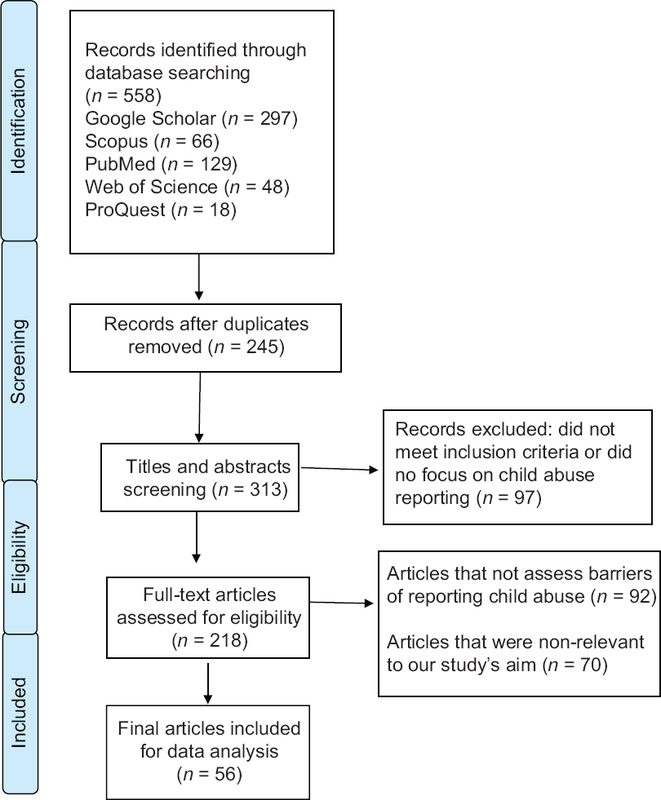 This narrative review study was conducted through searching the databases such as Google Scholar, PubMed, Web of Science, Scopus, and ProQuest. The inclusion criterion was studies in Persian and English languages which published in scientific journals between 1978 and 2017 and also refer to reporting child maltreatment. Studies which, despite referring to a child abuse, did not refer to the barriers to the reporting of child abuse were discarded from further analysis. 56 papers were used to write the present paper. The results of this study organized into four categories: individual barriers (knowledge of healthcare professionals, their attitudes and beliefs, their inadequate experiences, and uncertainty of the diagnosis), interpersonal barriers (fear of disconnecting therapeutic relationships and violation of privacy and secrecy principles), organizational barriers (poor communication and weak legal processes for reporting), and situational barriers (victims' characteristics and available evidence). Given the reporting of child abuse by healthcare professionals is affected by multiple factors such as individual, interpersonal, organizational, and situational factors, so considering a comprehensive and collaborative program for this public problem in all levels is important.